Usually with a cup of coffee. I tend not to have breakfast as soon as I wake up because I have a dog and I take him for a walk. I don’t have breakfast until about an hour and a half later. Do you always eat healthily? I tend to eat light but I have about six different light meals a day. I’m quite health conscious about what I eat – unless I’m in Belgium and I’m having too much beer! I’m not a fry up kind of guy, it’s got to be a lot of fruit and vegetables. Do you mix in a little bit of cake or ice cream? How do you make your cooking healthier? I would reduce salt, reduce the sugar and reduce the oil. That’s just because I like that way of eating. I like clean eating, I like being able to taste the vegetables or the fish or whatever I’m cooking. Cooking in a wok is healthier too because you keep all the nutrients in. I never boil vegetables. That’s a traditional Chinese way of eating, with several layers that marry together… some cuisines are very carb heavy whereas Chinese food is much more vegetable based. They use vegetables as a meat substitute – such as a dried shittake mushroom. In baking I like using things like fruit purees rather than sugar, or I’d make cakes stickier with agave or honey. I really like using almonds instead of flour. Do you have any tips for healthy Christmas? It depends what you want, I don’t believe in beating yourself up but being more careful with life. Instead of frying Brussels sprouts with lardons, steam them with chestnuts. Instead of covering your carrots and swede with loads of butter, serve them with good quality coarse ground pepper. Or maybe add nutmeg to your mashed potato instead of butter. I think you can get flavour in food really naturally, you don’t always have to add oil or butter. And that’s a personal thing really, I just don’t like the flavour of oil, it’s all about naked food, I like my food naked! Other than Chinese food do you eat other Asian food? I love Indonesian, I love Malaysian but if I’m cooking at home I cook a lot of Italian because they also use a lot of fresh ingredients and herbs, it’s very quick too. I avoid pizza because I don’t like that texture, but I love things like sun dried tomatoes and anchovies. Arrabiata is my favourite but I like it made with fresh anchovies and ground up olives. Is there much scope to use yogurt in Asian cooking? They do usually avoid dairy products but in something like a Thai curry you can substitute coconut with yogurt, or the same with anything like a Laksa cream based sauce like you get in a Malaysian dish or an Indonesian rendang, mainly the saucier dishes. But no it’s not something I’d put in a stir fry! Have you ever made your own yogurt? No never… I suppose it’s like making tofu? I’ve done that. Do you make anything from scratch that other people might buy instead? Mainly sauces. I make my own noodles at home when I have time but I’m not very good at making pasta. I make my own dim sum though. What five things would you always have in your fridge? Eggs, milk, vegetables, chilli, Activia and vegetarian cocktail sausages. I’m always snacking on those, they’re so much nicer than the real ones. Where do you buy your fresh ingredients from? All over really, although it tends to be supermarkets, purely because of speed. I love the idea of popping up to Wembley to buy fresh herbs then coming down to China Town but it’s just impossible. I made sure in my book that apart from 2-3 ingredients, everything was available in the supermarket for that reason. For speed it has to be that way because I spend so much time running around. If I had the time I would go to the fishmonger, the organic market but it does cost more time and money that way. If I’m doing a dinner for six people and it takes longer than an hour it’s not going to happen! So do you go in and push the trolley yourself or do you have it delivered? (visibly excited) I push the trolley myself! I can’t shop online. I can’t shop for clothes online, I can’t buy anything online. I’ve tried but I just can’t do it, I want to go and touch things, whether that’s food or clothes and accessories. I love shopping, why would I want to take away one of the things that I love by sitting at a computer and not having any activity or relationship with what you’re doing? 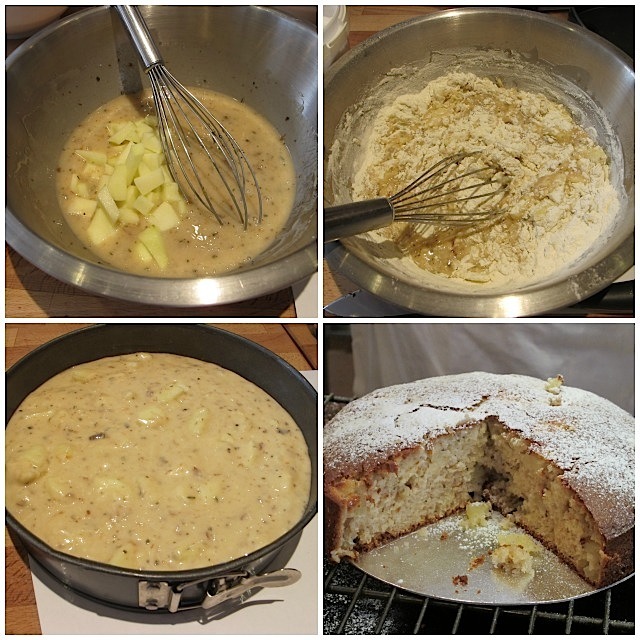 For our cooking task we were talked through this recipe by La Cucina Caldesi’s chef Stefano and then set to work. He explained that this recipe had been given to him by a “Nonna” in Tuscany and was highly adaptable different fruits, herbs, spices or flavours of yogurt and substituting flour for ground almonds. 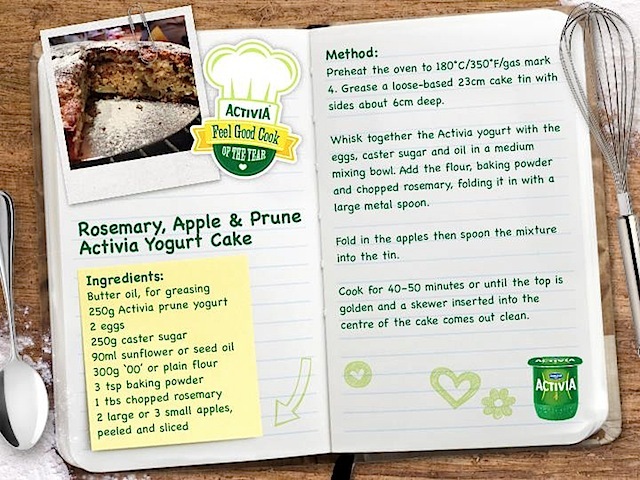 With that in mind, I shall be blogging my own Activia cake recipe inspired by this later in the week. 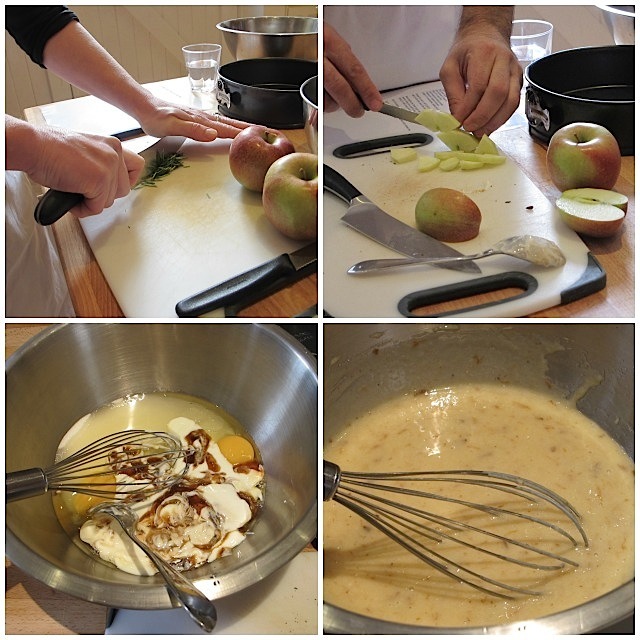 Once the rosemary and apples are chopped, it’s as easy as whisking wet ingredients together and stirring in the dry. Kind of like muffin batter on a bigger scale. 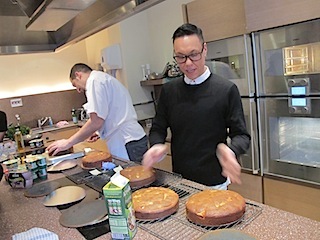 The cake takes around 45 minutes to bake and tasted fantastic warm from the oven. It works beautifully served alongside more yogurt or dusted with icing sugar and a drizzle of lemon juice. I was quite amused that Gok declared mine the most evenly baked with good distribution of fruit! 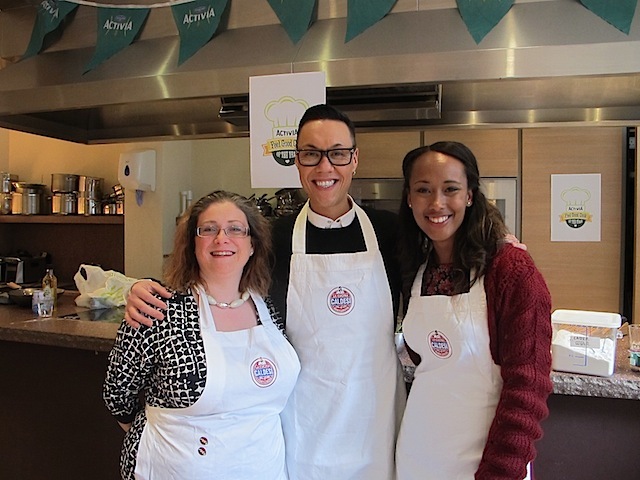 “Gok’s Wok” by Gok Wan is out now. What a great interview! and he seems like an awesome personality to talk to and share a cake or two with. The cake looks tasty and I am intrigued with the addition of rosemary. I must try that in my next apple cake. Rosemary and apple work really well together – although previously I’d only enjoyed them like this with pork! I am not calling him out, and I love Activia, but I do think that to say adding butter to something is unhealthy is rather missing the point. Replacing flour with almonds would actually increase the fat in a cake as well, and honey is essentially just sugar anyway. A healthy diet is a balanced diet. Food is also about pleasure. God, I sound such a kill joy! I think re almonds he was referring to it being an alternative for coeliacs which had come up in conversation earlier in the day. Honey is sugar but it’s not processed and agave nectar has lower glycaemic index than normal sugar. Quite whether these things make as much difference as – like you say – a balanced diet is up for debate! Am so envious of you meeting the Gok! Love this recipe too. What a great pairing rosemary and Apple is. Not sure about prunes in our household lol! Lush cake & lush Gok! You lucky girl, Sarah! He was so lovely, I might be tempted to go on his fashion show after meeting him! !